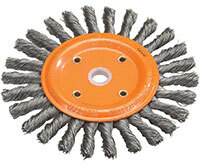 Walter Surface Technologies wire wheel brushes are made for precision cleaning with angle, bench or pedestal grinders. These industrial grade brushes are made from top quality wires that are perfectly balanced for minimal vibration and maximum user safety. Whether you are removing paint, rust, corrosion or need to do some light deburring, Walter’s line of wire wheel brushes offer you the quickest surface cleaning with the safest operation, making it the preferred choice for professionals in the metal fabrication industry.